This page links to resources and gives excerpts from resources, to include some cases in the Endnote, and is not a legal analysis of any law or the constitutionality thereof. and more detailed information can be found in Comptroller’s Rules 3.322, 3.161, 3.541 and 3.583. “For purposes of the tax exemption, a place of religious worship includes not only the sanctuary, but also those grounds and structures surrounding the sanctuary which are necessary for the use and enjoyment of the church.” [See the dissent for good info.] City of Austin v. University Christian Church, 768 S.W.2d 718, 719 (Tex.1988). 904 S.W.2d 621 (1995), CORPUS CHRISTI PEOPLE’S BAPTIST CHURCH, INC., Petitioner, v. NUECES COUNTY APPRAISAL DISTRICT et al., Respondents. No. D-4333. Supreme Court of Texas. Argued October 20, 1994. May 25, 1995. Rehearing Overruled September 14, 1995. Taxes are imposed upon real property each year as of January 1. Tex.Tax Code § 21.02. On that date a lien authorized by article VIII, section 15 of the Texas Constitution attaches to the property to secure their payment. Id. § 32.01. The amount of taxes assessed is not determined until later in the year, however, when appraisals have been completed and tax rates set. Id. §§ 26.01 & 26.05. Tax bills must be mailed by October 1 of the year for which taxes are assessed, or as soon thereafter as practicable. Id. § 31.01. Taxes are due upon receipt of the bill, and if not paid by February 1 of the following year, the taxing unit may sue to collect the tax and foreclose its lien. Id. §§ 31.02 & 33.41. Article VIII, section 2(a) of the Texas Constitution authorizes the Legislature to exempt the property of religious organizations from taxation, and the Legislature has exercised this authority. Id. § 11.20. To be entitled to the exemption, however, a religious organization, like certain others claiming tax exemptions, must apply to the chief appraiser in the district where the property 623*623 is located before May 1 of the first year for which the tax exemption is claimed. Id. § 11.43(a), (c) & (d). Application for the exemption in subsequent years need not be made unless the chief appraiser requires it. Id. § 11.43(c). An application for exemption was first required of religious organizations in 1982, after section 11.43 of what was then the new Tax Code took effect. Act of May 26, 1979, 66th Leg., R.S., ch. 841, § 3(a), 1979 Tex. Gen.Laws 2217, 2313. Before 1980, under the prior law, the procedure for claiming the exemption was for a religious organization to file with the taxing authority a sworn, itemized list of exempt property. Act approved May 14, 1931, 42nd Leg., R.S., ch. 124, § 1, 1931 Tex.Gen.Laws 211, 211-12 (formerly TEX.REV.CIV.STAT.ANN. art. 7150(1)). This statute was repealed, effective January 1, 1980, by the enactment of the new Tax Code. Act of May 26, 1979, 66th Leg., R.S., ch. 841, §§ 3(f) & 6(d), 1979 Tex.Gen.Laws 2217, 2315, 2330. The religious organization exemption under section 11.20 of the new Tax Code, which simply carried over from the prior law, became effective on January 1, 1980, along with other parts of the new Code. Act of May 26, 1979, 66th Leg., R.S., ch. 841, § 3(f), 1979 Tex.Gen.Laws 2217, 2315. As already noted, however, this was two years before the effective date of section 11.43, governing applications for exemption. Thus, in 1980 and 1981 a religious organization was not required to file a list of property, make application, or do anything else to claim the property tax exemption. (a) The chief appraiser shall accept and approve or deny an application for an exemption under Section 11.20 [for religious organizations] after the filing deadline provided by Section 11.43 if the application is filed not later than December 31 of the sixth year after the year in which the taxes for which the exemption is claimed were imposed. (b) The chief appraiser may not approve a late application for an exemption filed under this section if the taxes imposed on the property for the year for which the exemption is claimed are paid before the application is filed. (c) If a late application is approved after approval of the appraisal records for the year for which the exemption is granted, the chief appraiser shall notify the collector for each taxing unit in which the property was taxable in the year for which the exemption is granted. The collector shall deduct from the organization’s tax bill the amount of tax imposed on the property for that year if the tax has not been paid and any unpaid penalties and accrued interest relating to that tax. The collector may not refund taxes, penalties, or interest paid on the property for which an exemption is granted under this section. (d) The chief appraiser may grant an exemption for property pursuant to an application filed under this section only if the property otherwise qualified for the exemption under the law in effect on January 1 of the tax year for which the exemption is claimed. (e) An application may not be filed under this section after December 31, 1991. (e) Notwithstanding Subsection (a), the chief appraiser shall accept and approve or deny an application for an exemption under Section 11.20 after the filing deadline provided by Section 11.43 if the application 624*624 is filed not later than December 31 of the 12th year after the year in which the taxes for which the exemption is claimed were imposed and if the application is filed before January 1, 1995. This subsection expires January 1, 1996. Act of May 30, 1993, 73rd Leg., R.S., ch. 971, § 1, 1993 Tex.Gen.Laws 4235. Section 11.433 does not extend the time for applying for an exemption if the taxes have already been paid, nor does it permit refunds. Section 11.433 is similar to two other statutes enacted in 1991 permitting late applications for tax exemptions, although the permission granted by those two statutes has now expired. TEX.TAX CODE § 11.434 (six-year extension for school exemption until December 31, 1992); § 11.435 (two-year extension for charitable organization exemption until December 31, 1991); Act of May 27, 1991, 72nd Leg., R.S., ch. 836, §§ 6.3 & 6.4, 1991 Tex.Gen.Laws 2890, 2894-95. The Legislature has also extended the deadline for claiming a homestead exemption for a year after taxes are paid or become delinquent. Tex.Tax Code § 11.431. Section 11.431, unlike sections 11.433-.435, appears to have been motivated by constitutional concerns. See Op.Tex. Att’y Gen. MW-259 (1980) (“A legislatively designated cutoff date for homestead exemption claims under article VIII, section 1-b of the Texas Constitution will not alone operate to deprive a taxpayer of an exemption …”); see also Op.Tex. Att’y Gen. JM-221 (1984) (section 11.431 permits tax refunds when homestead application is filed late). Information collected February 8, 2019. Virginia Constitution: Article 10: Section 6. Exempt property. (6) Property used by its owner for religious, charitable, patriotic, historical, benevolent, cultural, or public park and playground purposes, as may be provided by classification or designation by an ordinance adopted by the local governing body and subject to such restrictions and conditions as provided by general law. Note. The above constitutional provision clearly indicates that the property does not have to be in the name of the church: “Property used by its owner for religious …purposes.” However, the law and forms may present a problem. The Code of Virginia § 58.1-3606. Property exempt from taxation by classification. Property owned directly or indirectly by the Commonwealth, or any political subdivision thereof. Real property and personal property owned by churches or religious bodies, including (i) an incorporated church or religious body and (ii) a corporation mentioned in § 57-16.1, and exclusively occupied or used for religious worship or for the residence of the minister of any church or religious body, and such additional adjacent land reasonably necessary for the convenient use of any such property. Real property exclusively used for religious worship shall also include the following: (a) property used for outdoor worship activities; (b) property used for ancillary and accessory purposes as allowed under the local zoning ordinance, the dominant purpose of which is to support or augment the principal religious worship use; and (c) property used as required by federal, state, or local law. Virginia law authorizes tax exemption on real and personal property owned by churches or religious bodies and exclusively occupied or used for religious worship or for the residence of its minister and such additional adjacent land reasonably necessary for the exempt use. Property can be held by incorporated churches or by unincorporated churches or religious bodies in the name of a Court-appointed trustee, an elected or appointed bishop, minister or other ecclesiastical officer with proper authorization or a corporation created pursuant to §57-16.1 of the Virginia Code, as amended, to hold the property. Exemption for Church Owned or Leased Vehicles. Affidavit Affirming That a Privately Owned or Leased Vehicle is Used for Church Purposes. We have gone over Indiana Property Tax Exemption law and what you need to do at closing to keep the property tax exemption. As we discussed, you will emphasize to the Title Co. what they need to do at closing and make sure they do it. I will talk to them as well as to the name of the owner in the deed, and the way the Trustee is to sign the deed. Call me at any time for any reason. 1) Is there anything I need to do with any conceivable “entity” to declare myself a ministry? I am not a pastor, but a prophetess. My ministry will be dedicated to the manifestation of the prophecies in the Bible. To the best of your knowledge, must the ministry be connected to a church? I am a believer in the house church and am not a part of an established church. 2) Is an IRS information return needed for donations received? I understand that this is required of a 501c3. 3) Do I call myself a non-profit organization, or is does that apply to a 501c3? 4) I am encountering a tricky thing regarding beneficiaries, as I don’t want to name other ministries. Truly the ones with beneficial interest are the “people of God” as a whole, especially the people of the Promised Land, which I believe to be the USA. I don’t know if I can say that legally. In addition, the projects that I plan to start in order to bring this about will involve people, places and things that have not yet come into being. Do you know of anyone who can counsel me about how to establish the beneficiaries of a trust in this prophetic context, in which the Spirit will be my guide? This comes with a prayer for you, your family, your church, and your ministry – that God may pour out His blessings on you, as you do on us! Thanks for your desire to please the Lord. Since you have asked me questions and given me information about what you are doing, I must answer you honestly and in love. A New Testament ministry must be under the authority of a church under Christ in all things. One cannot separate a God ordained ministry from a church under Christ. A ministry that is not under the authority of a church under Christ is not in God’s perfect will. Also, to be approved of God, a church and a ministry must be called of God and in line with Bible teaching in all things including leadership, makeup, doctrine, etc. To answer to your question, “Do I call myself a non-profit organization, or is does that apply to a 501c3?” would require more time than I have, so I just address one facet of the question. If you organize a church or ministry of a church as 501c3 or 508, you have just submitted that church or ministry to a head other than the Lord Jesus Christ. Why set up a trust (a properly ordered trust, not the type of trust you envision) and defeat its purpose by placing the entity you are trying to keep completely out of man’s control, and then partially submit it to man’s control? I can see by your e-mail that you do not understand the concept of the Bible trust and the beneficiary thereof. The “people of God” are not the beneficiaries of a church Bible trust. The trust used by this Churches under Christ Ministry is patterned after Bible trust doctrine and is recognized, not created, by American law as a non-legal entity. These matters took me many years of Holy Spirit led study of the Bible (the KJB being the Word of God in English), history, and law. When even a lost person, much less a born again believer, grabs bits of information for which he/she has no studied understanding, he cannot implement the information with knowledge and wisdom. Only those born of the spirit can understand spiritual matters, and the basis of understanding for that person in all matters concerning faith and practice is the Word of God (the King James Bible in English). Some people such as Peter Kershaw, Ben Townsend of the so-called Ecclesiastical Law Center push a ill-informed and flawed “trust” scheme and other deceivers misdefine and misapply the corporation sole (a type of non-profit corporation whose only difference from any other non-profit corporation is that it has only one, as opposed to several, officers) to allegedly help unknowledgeable pastors and churches organize outside man’s law. The former mislead churches in their application of the concept “church” trusts. The latter do not understand but nonetheless falsely promote and define “corporation sole” for unwitting churches who are seeking to do things the Bible way. These frauds who falsely claim to have specialized knowledge and skills mislead believers who seek to do things God’s way rely on these deceivers. The Bible conclusively proves that the USA is not the “Promised land” and reveals other errors in your e-mail which I do not have time to address. I know no one who can help you, including myself, because one of us has been misled by the wrong spirit. I am a born again believer in God the Son, the Lord Jesus Christ, and am convinced that God the Holy Spirit has guided me through my studies so that what I believe and teach is in line with God’s Word. I invite anyone to show me, from the KJB only without reference to any interpretation of the Bible or any other writing, where I am wrong on these matters. Again, I trust that you are sincere, but sincerely uneducated and misinformed about many matters. The evidence suggests that you have fallen for the lies of the LDS cult; if not, your email assertions match some LDS lies. I believe that the LDS church uses the King James Bible but other books take priority and are considered as authoritative. 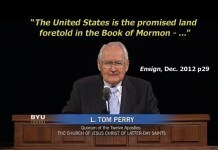 I believe that the LDS church teaches that the King James Bible is correct insofar as it is correctly translated and interpreted and that other LDS books fill in a lot which your prophets and teachers, as led by the god of this world, assert was left out of or incorrectly preserved in the KJB. Those deceivers have to correct it and fill in so as to accommodate the teachings of the devils, disguised as angels, who inspired them to believe their lies. The LDS church teaches a false Jesus and false doctrine and leads millions to hell. I write this to you in love hoping that you will see the error of your ways. I am not your enemy because I tell you the truth. I especially suggest that you diligently seek the Lord and the salvation He offers through His son (not the false Jesus of the LDS religion). I recommend the following as you seek the truth about God and eternity: What the Word of God teaches about Salvation and After Salvation.